I’ve known Hannah DeCamp on social media for a while and so I knew she had lots of picture book wisdom to share. And she’s agreed to share some! Gather round to find out her five elements of a successful read-aloud. Every week, I read a few books to a fantastic crowd of tiny bookshop patrons. Along the way, I’ve learned a few aspects that make a book really work for toddler/preschool storytime—when I read books that have these characteristics, I notice the kids’ eyes shine with alertness, they spout questions and comments, and I can tell they are really, deeply engaged in the book. Rhythm is key for a fun, engaging read aloud. The more musical, the better, as kids will catch on to the repetition and rhyme and be encouraged to join in as the story progresses. Bernstrom’s One Day in the Eucalyptus, Eucalyptus Tree has the perfect cumulative rhythm for storytime. A take on the “There Was An Old Lady Who Swallowed a Fly” song, Eucalyptus Tree features a little boy and his “whirly-twirly toy” that are immediately swallowed by a hungry snake. Hilarity (and an overstretched stomach) ensue as the clever boy encourages the snake to swallow more and more and more, until out everyone goes, in reverse order. There is something magical about the way Bernstrom combines descriptive, action-filled words to create an infectious, irresistible cadence for reading aloud. My favorite line? “Sneaky-slidey zipped the snake.” See what I mean? One key for kids’ storytime enjoyment: Seeing the pictures. A book can read aloud like a dream, but if those little ones sitting in the back of the group cannot see the illustrations, it will take them out of the story. Bold and bright art in a picture book will bring the visual story to your listeners most effectively. Morales’s illustrations in Alexie’s Thunder Boy Jr. are perfect for storytime sharing. They are brimming with energy and vibrant in color, and the thick outlines around each character and object make them pop off the page. The word bubbles are a great addition as well, helping to highlight each potential name the boy bestows upon himself, and the bright bursts of color add visual interest and intensify the action in many of the spreads. Speaking of spreads, that’s my favorite one pictured. One of my favorite things about storytime is how kids often notice visual cues that are not explained in the text. Picture books with dramatic irony (the audience knows/sees what the character does not) make this even more hilarious, as the audience tries and tries in vain to get the character to notice what they see. The bonus? It makes even the youngest of readers feel a bit more confident—here is a book that acknowledges their smarts and their attention to detail. 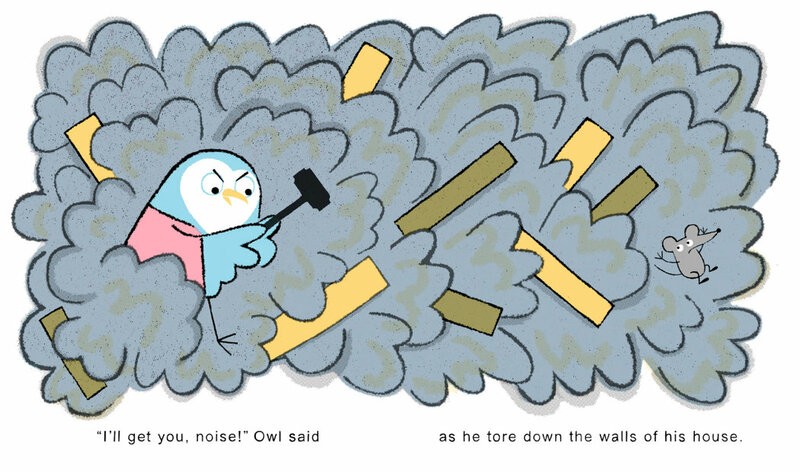 The invitation to interact with the story is a powerful one for little readers, and Pizzoli cleverly invites them in as Owl talks to himself and the mouse gradually becomes more obvious in the illustrations. SQUEEK! When all else fails, make ‘em laugh. Some of my best storytime experiences have had both the audience and me in tears from laughter—luckily, there are tons of hilarious books out there (case in point: all of the books on this list are giggle-inducing), so many that it’s hard to pick just one to highlight. But I must pick one! 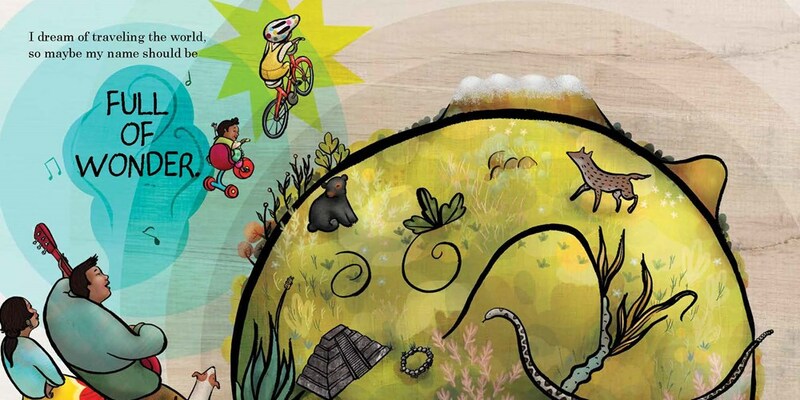 Big Bad Bubble is the perfect combination of weird and silly that hits all the right notes in a read aloud. Number one: Things disappear in our world and reappear in a place called “La La Land.” Number two: The hilarious notion that giant, scary monsters would be terrified of… bubbles. Number three: The way these giant, “scary” monsters look (a comic genius, that Daniel Salmieri). Number four: The narrator encourages audience participation, usually as a means to encourage or scold said giant, “scary” monsters—I can tell you from experience this leads to some very funny outbursts. Number five: Say the names Yerbert, Froofle, Wumpus, and Mogo Pogo. ‘Nuff said. A good storytime book has well-timed page turns to keep readers engaged in the story, making them excited about what comes next. A little drama is always fun, and so are surprises. 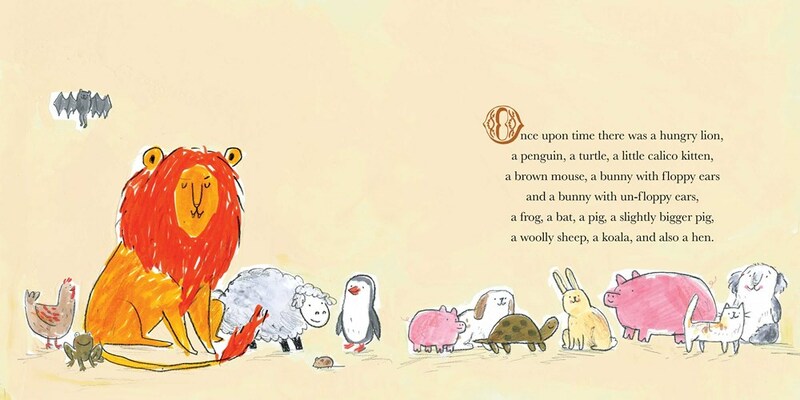 A Hungry Lion or A Dwindling Assortment of Animals is a macabre (yet hilarious) mystery, and as you might guess, the eclectic assortment of animals that we begin with starts decreasing in number with each page turn. BUT there are a couple of twists that will take even the most clever of readers by surprise, creating a read aloud that is So. Much. Fun. Wide eyes and gasps abound. I love how Cummins gives her narrator a familiar tone with interjections of “Hold on,” and “Wait a second,” and “Hmm,” allowing the story to pause, catalog the ever-shortening list of animals, and slowly build on the suspense. She also utilizes wordless spreads—zooming in on a character in one, turning out the lights in the other—as another way to keep the tension perfectly pitched. Who will be the last animal standing? You’ll just have to read to find out. 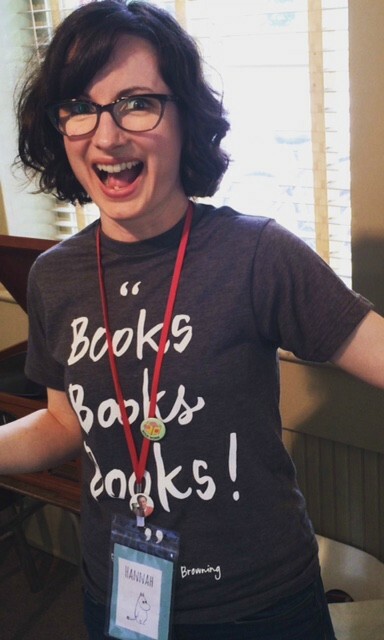 Hannah lives in Athens, GA, where she works as the school engagement specialist at Avid Bookshop by day and blogs about children’s books at The Bimulous Bookshelf by night. She often daydreams about living a calm and peaceful life in Moominvalley or traipsing the Maine coast with Miss Rumphius. A librarian at heart (and in training), Hannah loves the look on a kid’s face when they find a book they truly love. Big thanks to Hannah for stopping by and sharing her storytime smarts! Such a pleasure to have her. Check out her blog or follow her on twitter! You might also be interested in 7 Completely Awesome Board Books recommended by bookroo. read the books, read the books at storytime!